Release Date: 2005 Running Time: 30 mins. Refusing to slip silently into old age, instead creating a personal ceremony that celebrates age and wisdom, a group of Jewish women decided to embrace their lives anew on their sixtieth birthdays. Timbrels and Torahs shows how, instead of slowing down, women can re-energize themselves and welcome the last chapters of their lives. 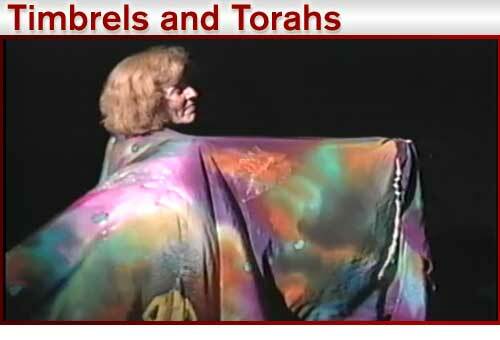 Timbrels and Torahs shares the story of a group of feminists who adapted their Jewish culture to their own ideas of equality, in order to combat the taboos of aging. Speigl found it unacceptable that much of Jewish ritual life has traditionally relegated women to the sidelines, so she decided to do something about it. Through group collaboration, she and her friends created a highly-personal ceremony that recognizes a woman’s value in the community and celebrates her past, present, and future. The creators of the Simchat Hochma looked to the Biblical character Miriam as their guide. The Bible records a celebration in which, “Miriam took the timbrel in her hand and all the women danced.” The prophetess was not afraid to follow her own song and be a leader among women. Thus, she inspired the women in the film to do the same, as her timbrel inspired the title of the documentary. Instead of succumbing to mainstream culture’s negative attitude toward aging, participants in the Simchat Hochma challenge it by empowering themselves. Western society’s fixation on youth has stigmatized older women, but the women of Timbrels and Torahs believe age should be celebrated and enjoyed as proof of wisdom and experience. The ceremony also stresses the importance of acceptance. A woman undertaking the ritual is encouraged to reflect on her life thus far, embracing both her successes and struggles. At sixty, some women have lost their spouses and the Simchat Hochma serves as an opportunity to try to come to terms with this loss. Many women also put on a kittle (a burial shroud) half-way through the ceremony to symbolize acceptance of their own inevitable death. The structure of the Simchat Hochma is subject to interpretation by each individual, with its creators suggesting eight key elements as guidelines to be interpreted, or disregarded, as the celebrator sees fit: community participation, a naming ceremony, reading Torah, a healing ceremony, receiving blessings, acknowledging mortality, a legacy (tree planting), and a covenant. The creators of the Simchat Hochma wanted to expand Judaism to include all of its members. After a history of feeling ignored by their faith, the last thing these women want to do is deny men equal participation. The creators say that they hope that in the future men, too, will mark their sixtieth birthday with a Simchat Hochma. Ultimately, the Simchat Hochma is a celebration of life–in all of its stages. Even during its last chapters there’s still time to grow, opportunities to change, much to learn and new experiences to be had. “I will not live in fear,” one woman declares as a promise to herself, “I will not live an unlived life.” The mantra rings true for all ages. Life only becomes static when one stops recognizing adventures.